February is blustering to an end, but it looks like Mother Nature has lots more winter in store for the Northeast and Midwest. It’s even been frigid in Florida! 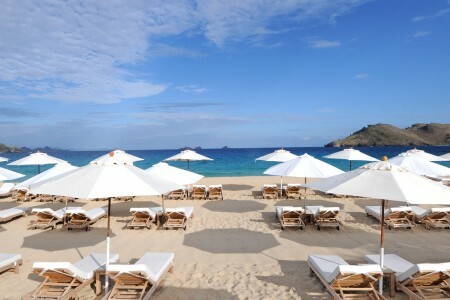 I hope I am tempting you to come and warm up in sunny St. Barth. February is always a fun month on the island with Valentine’s Day prompting romantic getaways and the school vacation break bringing families with children. In recent years we’ve been delighted to see more multigenerational villa bookings. It’s a wonderful way to reconnect – and make memories that will last a lifetime. My own son and SBP VP, Tom Smyth, was on the island with our two teenage grandsons, his wife Amy and her parents. So we were part of that demographic, and it was loads of fun. The boys love the water sports, pool time and the Pierrade at Andy’s Hideaway. Cooking the “combo” (duck, chicken and beef) on the communal hot stone has become a family tradition and we all love the four yummy dipping sauces – and the frites. I took some time off from the office and villa inspections, and my husband and I joined them for a day cruise and some leisurely vacation-style lunches. One of our highlights was sharing a special evening at Villa Au Soleil with a dinner prepared and served by private chef Manu. Highly recommended! If you are in the mood for love, check out our new Pinterest Board – The Romantic Villas of St. Barth – and let one of our villa specialists and concierge team help you plan the ultimate romantic dream vacation. Sunset cruises, dinners under the stars and couples massages. Wouldn’t you just, well, love it? The very private and romantic Villa Colibris, where a dramatic king-size 4 poster bed is the focal point of what is essentially a suite with an elegantly furnished little sitting area. The spacious en suite bath with its oversized double vanity and its WOW shower is Architectural Digest-worthy. Its delightful infinity pool overlooks Lorient and St. Maarten in the distance. The terrace features a compact, covered open-air kitchen and ample outdoor space for living and dining – and sunning. Villa Sucriers where the sound of the sea, the scent of hibiscus and a spectacular view all contribute to the ambience of this lovely 2 bedroom villa in Camaruche; its Caribbean-colonial décor provides a touch of elegance throughout. The air-conditioned bedrooms, with private terraces, are located in a separate pavilion and share a kitchenette. Both have 4-poster king beds and en suite baths with double sinks, bidets and rain showers. The swimming pool is located nicely between the main house and the bedroom pavilion. A poolside gazebo is just one of its special features and a great spot to toast the sunsets. And the name? A Sucrier is a little sugarbird that guests enjoy seeing “dining” at the feeder. Note: The one-bedroom Villa Colibris is next door and can be rented with Villa Sucriers to provide a 3rd bedroom. Villa Bord de Mer is located in the charming fishing village of Corossol, and just across the road from its beach, this nicely simple 3 bedroom house is the perfect spot to just “be.” The view is beautiful and the sunsets are postcard-worthy. The bustle of Gustavia’s shops and restaurants and gorgeous Flamands Beach are both just a 5-minute drive. The pool is lovely and the terrace offers a spot for alfresco dining. The master bedroom has a queen 4 poster bed and an en suite bath. Glass sliders provide access to the pool terrace and frame the view. The other two bedrooms (one king and one with twin beds) have designated bathrooms, one with a bathtub. By the sea, and aptly named Bord de Mer, this gem is ideal for a family looking for beach house–style relaxation. Lucky you! You have discussed hotel options with one of our award-winning St. Barth Properties Specialists and have chosen to stay at the 5 star beachside boutique property Hotel Saint-Barth Isle de France. It is as magical as the sound of its name with an ambience that artfully blends its French West Indies location with the casual sophistication of its “cousin” the South of France. You were looking for a romantic idyll and you have arrived. Your spacious and lavish 1 bedroom Beach Suite includes a full kitchen, an airy living room and comfortable elegant furnishings bedecked in cool cottons and vintage French fabrics. Your king-size bed boasts a view of the sea, and there’s a sumptuous oversized en suite bath with a tempting stone soaking tub and indoor and outdoor showers. A private terrace with your own infinity edge plunge pool is just steps from the brilliant blue waters of one of St. Barth’s most gorgeous beaches – Flamands. Have you had a chance to check out our new Pinterest Boards yet? The Glorious Pools of St. Barth, St. Barth Eat & Tell, Look What I Bought in St. Barth, A Day at the Beach and more including a board devoted to villas perfect for friends and family. Follow us! And we’d love to see your St. Barth Pinterest boards, too. This luxurious 2 bedroom, 2 1/2 bath villa is perfectly situated on the hillside of Anse des Cayes with unobstructed northeast views of the sea. The bedrooms with en suite baths are on opposite sides of the villa to ensure privacy and have their own access to the outdoor spaces. A generously sized living room, gourmet kitchen and a dining area open out to the sprawling terrace with a pool and Jacuzzi. The comfortable outdoor living areas include a gazebo with a BBQ and terraces for sunbathing. Downstairs is a large (12'x20') room that can be utilized as a third bedroom or a home office. The property enjoys a very strong rental history. Les Bananiers - a fun local place with great food, service and value! We loved the entire experience. Agave Azul was amazing. It really was a perfect honeymoon. Thank you for your guidance and help with the villa. The entire company did a great job from the first call.